After a lifetime of labor, Unity House retirees are unique in Hawaii in that they can look forward to many years of just having fun. 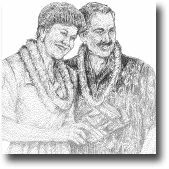 That's because Unity House, in conjunction with the City & County of Honolulu, sponsors one of the biggest and best retiree programs in the state. The Retiree Center is conveniently located in Downtown Honolulu at 171 North Pauahi Street. Retirees are welcome to participate in a variety of activities such as Hula, Line Dancing, Bingo, Luk Tung Kuen, Aerobics, and board games. They also enjoy scheduled group excursions and trips. In November, Unity House honors its Retirees at our Annual Thanksgiving Luncheon. In appreciation for all of their hard work and dedication throughout the years, our retirees are treated to a complete turkey lunch, entertainment, and fabulous door prizes. Check the Calendar for event date. For more information on any Retiree Activity, contact Lowell at 585-6446.